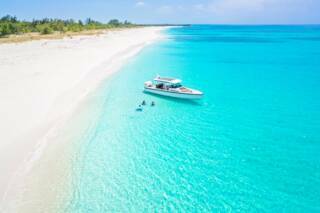 Most of the evening cruises depart from the Leeward region of Providenciales. An evening boat excursion can be a great way to end the day in the Turks and Caicos and watch the sunset from the ocean. If you’re lucky, you may also spot the elusive green flash atmospheric phenomenon. Tours usually take between one and three hours. At least one complimentary drink is usually included, but many cruises offer bottomless alcoholic and non-alcoholic drinks, along with snacks. 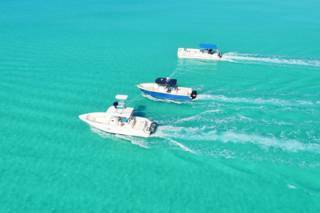 The waters surrounding the Turks and Caicos are quite challenging from a navigator’s perspective, and consequently the routes taken on the typical sunset excursion are those within easy access of the marinas. Sunset over the Caicos Banks. The Leeward and eastern Grace Bay area is the most popular cruising region, and the tour sights here include the uninhabited Turks and Caicos Rock Iguana habitat island of Little Water Cay, the barrier reef and break, and the resorts and hotels of Grace Bay Beach in the distance. 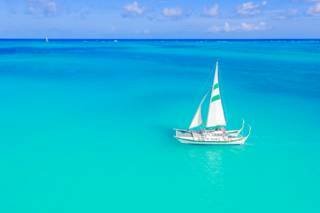 As is the case with most boat cruise and ocean activities in the Turks and Caicos, we advise that you book your reservation in advance of your vacation, especially for private charters. The regularly-scheduled and public party sunset sailing voyages, such as the evening Atabeyra cruise, tends to have a bit more space for short notice bookings. Sunset sail off of the Caicos Cays. There’s a wide selection of vessels and cruises to choice from, and your options include everything from a tranquil sailboat or catamaran up to a luxurious private charter yacht. The various vessels offer different atmospheres, from quiet and serene, to the party trips with music and a bit more of a boisterous vibe. For a few days after a full moon and at fifty minutes after sunset, small marine glow worms rise from the ocean floor and light up the water with a greenish glimmer. Usually occurring on the ebbing tide and best seen in the shallow waters of the Caicos banks to the south of Providenciales, this phenomenon is caused by a fluorescent photoprotein that the female worm releases with its egg mass. The glow worm performance isn’t completely predictable, with many variables including weather and location affecting the experience. We recommend contacting boat cruise operators in advance to determine the most appropriate times and dates. The Beluga’s afternoon and full day cruises end the day on Grace Bay with the setting sun. Relax with a refreshing drink.